Back of card: The back shows the tigers from the Five of Wands (above)in a blue-green/black moire field. As they are repeated upside down on the bottom half, the cards may be inverted. Uniquely, the tigers on the back are the same colors as the tigers on the front. Comments: Where your tatoo is determines which card you are looking at. For the major arcanas, all the tatoos are on male chests or female backs. 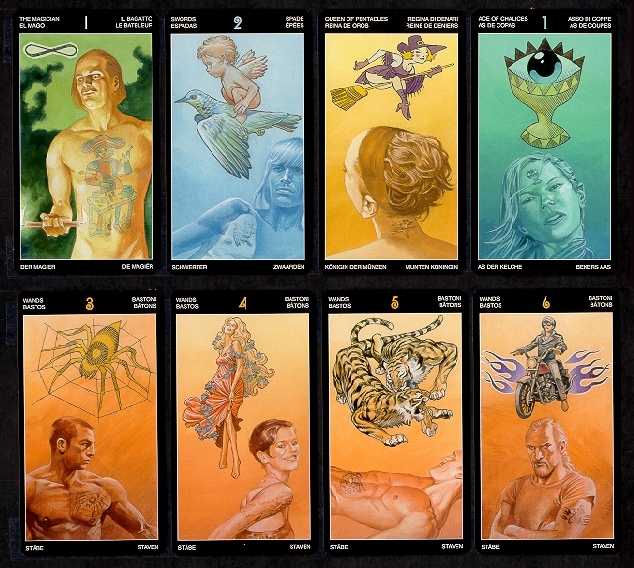 These tatoos are all taken from the Marseilles Tarot, but few of them are well-displayed on the cards. The host bodies do not seem to add very much to the displays. Among the suits, the tatoo for the ace is always found on the forehead. The two is on the right breast, the three on the left breast, the four on the right arm, the five on the abdomen, the six on the left arm, the seven on the right buttock, the eight on the left thigh, the nine, centered, on the lower back, directly above the buttocks, the ten on the lower back directly above the nine. The tatoos for the knaves are shown on the left shoulder blade, for the knights it is found on the right shoulder blade, and both the king & the queen are found on the nape of the neck. None of the illustrations on human skin are shown very well at all. Not on the major arcanas, not on the pip cards, not on the face cards. On the suit cards, the tatoo is also shown, in good detail, elsewhere on the card, but I cannot see the images have much significance in & of themselves. The Ten of Cups, for example, which usually symbolizing earthly contentment, here shows a serene Budha, a person who hss found contentment by abandoning the material world altogether. Introductory notes say that tatoos were discovered by Captain James Cook in his exploration of Pacific islanders. The introduction then says that, well, of course, tatoos were already well-known throughout the world, including Europe. If the instructions - or this deck - had gone on to include scarification & piercing, it might have elevated this deck above the level of mere gimmick. For many cultures, tatoos, scarifications & piercings are part of rite-of-passage ceremonies. This could easily have been a much better deck. I used to depend upon Lo Scarabeo for innovative tarot decks. What's happened to them?